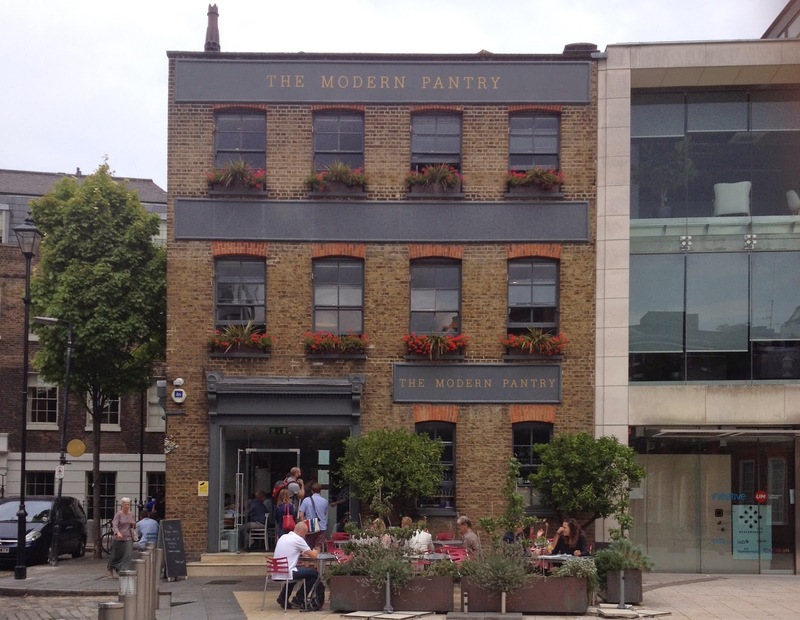 When my brunch chums and I turned up at The Modern Pantry in Clerkenwell, London for breakfast one recent weekend morning I was surprised at how distinct the building was from the rest of old London town. While navigating my way through East London with the aid of Google Maps I was slightly worried about getting lost, but honestly you can’t really miss it, with its brick walls and greenery a stark contrast to its modern neighbours. I’d been looking forward to this Monthly Breakfast Club brunch at The Modern Pantry for a long time and I rang up and booked a table two weeks prior. I must say I was disappointed when we were shown to a table on the second floor shoved in the darkest corner of the restaurant. But the rest of the establishment is light and airy - making me even more miffed at where we were seated – and on a gorgeous Saturday morning most people were sat with sunlight beaming through the open windows. The Modern Pantry is indeed very modern, but in a clean-cut way that felt very welcoming. Across three storeys the rooms feature a grey and white décor, with wooden floorboards and a couple of dashes of colour coming from the odd single-stem flower in a vase. Tables were simply set with heavy silver cutlery, quality white napkins and little pots of brown sugar. It felt like a little bit of Chelsea in EC1. The waiting staff wore crisp white shirts with long grey aprons down past the knees, but sadly what they didn’t wear was a smile on their faces. But despite a slightly surly service the food was fantastic. We looked through the vast breakfast menu, taking a while to make our way through the choice of 12 teas and many other beverages. We started with smoothies, and mine was a deliciously fresh passion fruit, orange, banana and honey concoction (£4.50). The citrus notes cut nicely through the banana and was smoothly rounded off with a good helping of sweet honey. For brunch, three of us went for the sweetcorn, feta, green chilli & curry leaf waffle, with smoked streaky bacon (£8.80). The food took quite a long time to arrive, but as usual my brunch chums and I were whiling away the time with a good gossip. When the food arrived – pushing 30 minutes after ordering – everyone’s food arrived apart from mine, and while we were waiting for the remaining plate my friends politely waited for me. But after a good few minutes the waiting became awkward, and with my friends all gazing longingly at their food I encouraged them to go ahead without me before it went cold. Mine arrive a minute or so later, and then my friend’s had to go back to the kitchen because on closer inspection and comparatively to the rest of ours, her waffle was burnt and crispy down one side. Luckily a replacement came out in seconds. The Modern Pantry is known for its unusual inventions and combinations of flavours and the waffle lived up to the hype. The doughy-waffle was thick and soft, enveloped in maple syrup and stacked on top was a few rashers of deliciously crispy bacon. Inside the waffle was sweetcorn, chilli leaf and feta. At first I couldn’t taste the chilli, but after a couple of bites a warming sensation crawled up my tongue, and it was surprisingly very pleasant. But the best bit of the waffle was the feta cheese, which my friends and I would have liked to have seen more of. It was like feta roulette with every mouthful, praying for a salty treat with each bite. It was worth the trip to see what all the fuss about – chilli leaf and waffle, who would have thought? !